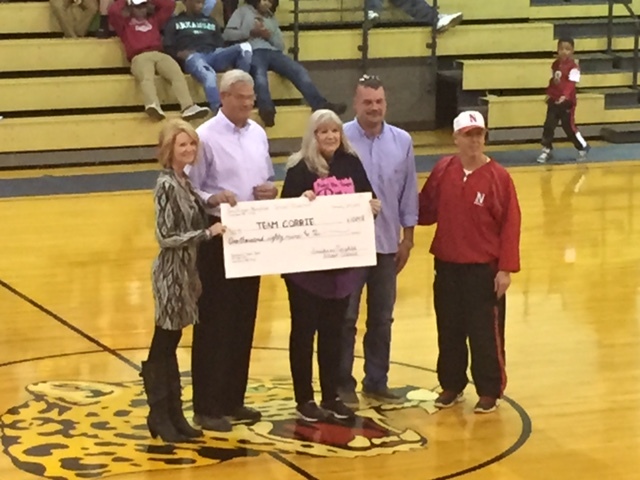 On Thursday night, Norphlet Athletic Director Dennis Steele presented a second check for the Team Corrie Cancer Foundation in the amount of $1,089. For more information about the Team Corrie Cancer Foundation, click here. Posted in Buckaroo News on January 31, 2015 by The Buckaroo Blog. The 2015 Lady Buckaroo Softball Schedule has been released. Please click on the link below to access the schedule. Posted in Buckaroo News on January 30, 2015 by The Buckaroo Blog. The Norphlet High School Student Council is selling DVDs of their “Walk to Remember” Slide Show which was shown at Norphlet’s Homecoming Assembly. DVDs are $5. Please contact Ms. Lyn Jackson at NHS if you would like a copy. Posted in Buckaroo News on January 29, 2015 by The Buckaroo Blog. Smackover High School basketball pictures will be made next Tuesday, February 3rd, beginning at 1:00 p.m. Forms will be handed out by coaches on Monday. Posted in Buckaroo News on January 28, 2015 by The Buckaroo Blog. It’s time to register students for Spring, 2015 Little League Baseball. Registration will be held February 12th at the Parent/Teacher Conferences from 1:00 until 7:00 pm. February 20th is the final day for registration. For more information, please click on the three links below. Posted in Buckaroo Community on January 27, 2015 by The Buckaroo Blog. Congratulations to the following Smackover Elementary School students for meeting their Accelerated Reader goals for the second nine weeks! Posted in Buckaroo News on January 26, 2015 by The Buckaroo Blog. Monday night Smackover High School will play Parkers Chapel beginning at 4:30 pm. Junior girls, junior boys, senior girls, and senior boys will all play. This will allow the senior high team to make up one of the nights lost to the football season. There will be no 7th grade games Monday night. All money raised from Junior High Night at Norphlet on Thursday will be donated to the Team Corrie Cancer Foundation. Come support your teams and the Team Corrie Cancer Foundation! Posted in Buckaroo News on January 25, 2015 by The Buckaroo Blog.